Tiny amounts of blood in the stools occur in about 20 percent of marathon runners, according to "Marathon Medicine." This occult -- or hidden -- bleeding is only detectable by laboratory tests. Visible blood in the stools plus cramping are much less common. Many conditions -- such as infections, inflammatory bowel disease or diverticulitis -- that cause cramping and blood in the stools when not running can also produce these symptoms after a run. Rarely, these symptoms are due to a serious condition called runner's ischemic colitis. If you notice any cramping and blood in the stools after running, see a doctor promptly -- do not attempt to self-diagnose. Your doctor will consider your age, medical history and physical exam findings, along with your symptoms, to help determine the next steps. For instance, diverticulitis is a problem in the intestines that might cause these symptoms, but it is uncommon in people under 40 years old. Maroon stools usually indicate a problem in the upper part of the digestive tract, such as a bleeding stomach ulcer. Bright red blood suggests a problem lower down, such as hemorrhoids. In people who participate in rigorous endurance training, a diagnosis of runner’s colitis might be considered. Your doctor will want to know your training intensity and whether you had these symptoms previously. Runner's ischemic colitis is thought to be rare, but reports are increasing. During intense exercise, blood shifts from the gut to the muscles, where it is needed. In some endurance athletes, the shift can become extreme, causing damage to parts of the intestines. This causes bleeding and cramping pain, often on the lower left side of the abdomen. Bleeding is usually mild, and the blood may be bright red or maroon, mixed in with the stools or separate. Nausea, vomiting, bloating, an urgent need to defecate, fever and racing heart may also occur. Symptoms normally resolve in 72 hours, and the colon heals within 2 weeks. However, the condition can occasionally be life-threatening, requiring surgery and/or treatment in an intensive care unit. If you experience cramping and blood in the stools after running, seek medical assistance immediately. If symptoms are due to runner's colitis, one of the most effective first-aid measures is to discontinue the exercise and drink plenty of fluids. This will help your body compensate for the loss of blood and combat dehydration. Once you are in the care of doctors, tests will be done to determine the cause, and appropriate treatment will be given. Hospitalization may be necessary. 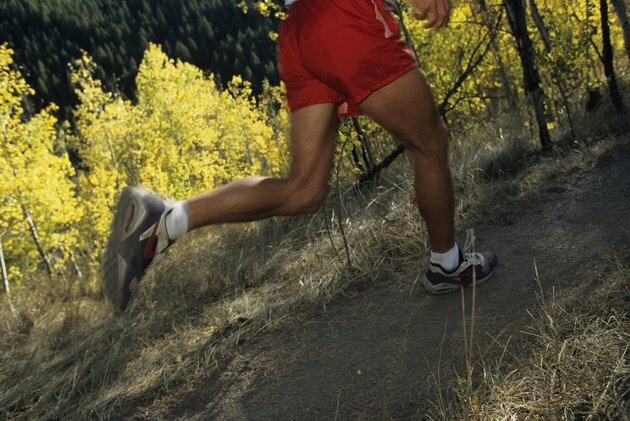 Start training at a comfortable pace, and increase your distances slowly over time. This allows your body to adapt to the increased workload. Keep hydrated before, during and after exercise, and be sure not to overexert yourself. Also, before preparing for a marathon, consult with your doctor to discuss any existing health problems and review your current medications. Nonsteroidal painkillers, such as ibuprofen (Advil, Motrin), increase your risk of blood in the stools and possibly cramping -- they should be avoided if possible. Medications that restrict blood flow to the intestines, such as some migraine or cold medications, may also increase your risk of these symptoms. Marathon Medicine; Dan Tunstall Pedoe, et al. Sleisenger and Fordtran’s Gastrointestinal and Liver Disease: Pathophysiology, Diagnosis, Management, 8th Edition; Mark Feldman, et al. Textbook of Gastroenterology, 5th Edition; Tadataka Yamada, et al.